No one was more prepared to cut spending, ‘right-size’ Fulton County government, and improve services and relationships with other jurisdictions, than Lee Morris. As a CPA and Attorney with degrees from Duke University and Emory University, and having served on the Atlanta City Council where he was an outspoken critic of corruption and waste in government, Lee was uniquely qualified to lead real change in Fulton County government, which he has helped accomplish over the past three years. Lee and his wife Gilda have been deeply involved in our community since moving to Fulton County in 1981. Lee serves as Lt. Governor Cagle’s appointee on the Georgia Public Defenders Council, and served on the Georgia Regional Transportation Authority as an appointee of then Governor Purdue. He has served on the Boards of Literacy Action, the Park at St. Luke’s, PEDS (the pedestrian advocacy group), the Midtown Alliance, the Buckhead CID, the Midtown and Downtown CID’s, Common Cause GA, NPU-E, Regional Leadership Forum (chairman), The Civic League for Regional Atlanta (chairman), the Piedmont Park Conservancy, and The Galloway School, among many, many others. He is a member of the Buckhead Lions Club and the Buckhead 50. He coached youth sports at Peachtree Road Methodist, Buckhead Baseball and Northside Youth Organization. After practicing as a CPA for 3 years, then as a tax, corporate and benefits attorney for 9, Lee served as General Counsel and CFO for an Atlanta-based architectural-engineering firm for over 32 years until retiring in March, 2017. Gilda worked as the fitness director at the gym at Peachtree Presbyterian Church until her retirement. Lee and Gilda have been active members of St. Dunstan’s Episcopal Church for more than 40 years. 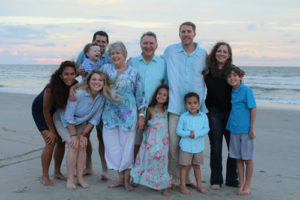 The Morris’s have three grown children and four grandchildren.